Improve: Fit, Comfort and Performance. Improve the fit, comfort and performance of your customers’ sport and running shoes with currexSole sport insoles. Designed specifically for different sports, currexSole insoles are designed to fit in football boots, ski boots, walking boots and cycling shoes as well as of course running shoes. RUNPRO running insoles help to maintain good foot posture which in turn enhances the body’s natural ability to attenuate shock. When running your client’s feet have a natural pathway they move along – our insoles help them to maintain that pathway as they create the ultimate fit solution: enhancing comfort, feel, function and performance. Running shoes vary in their fit, feel and levels of support, however running shoe insoles are mass produced and offer very little cushioning or support. And that is where our high quality running insoles like the RUNPRO really make a difference. 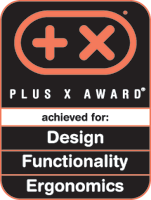 Running design has changed a lot in the last few years – manufacturers now love to talk about ‘guiding the foot’, well that’s bang on with our philosophy (which we’ve been following since 2008). Footwear solutions work best when they feel comfortable. The sockliner (shoe insert) is designed to improve aesthetics within the shoe (cover stitching etc). Replacing the Insole should make the shoe more comfortable and CurrexSole insoles are specifically designed to increase the FIT and COMFORT of your customer’s shoe. What's so special about currexSole? currexSole are truly ‘dynamic’ insoles and designed specifically for sport. The key concept is to enhance performance and alleviate ‘issues’ caused by excessive pronation and fatigue. How they fitted into the shoe was a major design consideration as distorting the upper material has an affect both function and performance. We also had to ensure that the performance features of your footwear were not compromised. Comfort is a given. The key design feature is the Dynamic Arch Technology (DAC), it guides the foot to a more efficient position throughout the entire gait cycle. 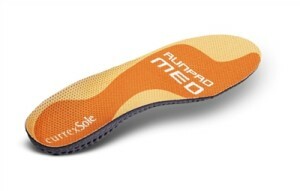 Energy – normally dissipated by the cushioning materials in other insoles – is stored. During the ‘propulsion phase’ the DAT returns energy helping to propel you forward during toe off. The insoles come in three different arch heights accommodating your customers varying foot types. So they don’t just cushion? No, they are dynamic functional insoles. You will often see ‘cushioning’ promoted as the main feature of some designs, but often too much cushioning causes the injury you are trying to avoid. Our philosophy: your body has an amazing ability to absorb shock. However, through poor function, this diminishes. 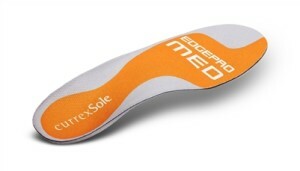 currexSole insoles help to guide the foot along it’s preffered motion pathway, enhancing the body’s naturally shock-absorbing properties, even as the foot starts to fatigue. Too much cushioning dumbs down the brain’s understanding of the impact forces and therefore its response and timing is diminished, leaving you predisposed to injury. The original concept was from Bjorn Gustafsson a former world triathlon champion who studied sport science specialising in rear foot motion and fatigue in running. He has worked with several shoe manufacturers and countless athletes – he regularly holds lectures in running biomechanics and footwear throughout Europe. Why should you stock currexSole? currexSole insoles offer a unique service that will enable you to increase your credibility as a specialist and offer your customers a specific insole to accommodate their foot type. currexSole make more profit from each running shoe sale. 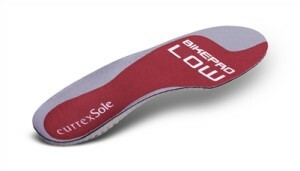 The currexSole measuring device (much like the wet test but much more accurate and less mess) allows you to analyse, recommend and fit the right insoles easily and quickly using a device enabling you to stand out from the competition. With more than 70% of runners suffering from injury each year you need to provide an effective injury prevention alternative. currexSole provide a solution for many sporting injuries, such as plantar fasciitis, shin splints, knee pain, blisters etc. Anyone involved in sport from a jogger with niggle to elite athlete looking for an edge. currexSoles are small technological powerhouses beneath your feet. The latest sports-science research findings influence our patented technologies. 1 Biomechanical Heel Guide: The Autofit Heel Cup. Research findings have proven that the sheer inflexibility of stiff heel cups hinders perfect performance. That’s why currexSoles offer the Autofit system: Soft, specially designed heel cups which allow movement between the heel and mid foot, yet still ensure firm support. You’re wearing the perfect shock absorber! 2 Triple Layer – For Your Foot’s Comfort Zone. You can feel it – and it feels really good: Your foot is supported by a total of three layers. Less sweat and odor, improved air circulation – and no chance of blister formation! The top layer is made from supportive microfiber. The mid-layer is Freeflex Memory Foam, which adjusts pleasantly to the foot and is impregnated with high-quality bamboo charcoal. The bottom layer is a unique mix of natural rubber and EVA, giving an active foot the space it needs – when it needs it. Hard materials in conventional insoles block your movements. However, in currexSoles the arch of the foot is supported by 3D DAT, a dynamic mid-sole bridge made from nylon composite. It supports and guides, and also reduces excessive movements which are often the cause of overload complaints. Mechanical energy is stored like in a spring: The result is the most efficient propulsion you have ever experienced! Three profiles are available: High, Med and Low. 4 Outstanding Cushioning: MC (Metatarsal Cushioning). When things get intense during sports, the ball of the foot needs particular protection. currexSoles are real cushioning wonders thanks to Poron®, the global leader in performance cushioning. Weight is uber important, we have worked hard to produce the lightest functional insole available – and with an average of 41,000 steps per marathon a simple weight calculation (with one of our competitor’s insoles) will conclude that you will be adding a total of 1.6 metric tonnes to your swing phase. The foot is a highly complex structure and product knowledge and education is paramount. We can provide all our retailers with in-house training and will shortly be releasing our currexSole ‘fitsology’ manual with detail injury guides and FAQ. We have been growing organically for three years slowly building a retail and medical base. 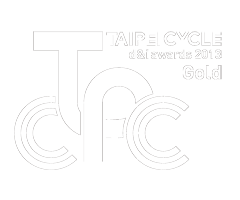 We also have a trade and consumer advertising strategy. Recently we have employed a PR agency to help get the word out – but our current customers are our best ambassadors and sales team. Identify your customer's insole size and profile in seconds. Let your customers feel the benefit of currexSole insoles in their sports shoes. Holds 51 insoles plus the Footdisc Measuring Device. For running, walking and triathlon. For football, rugby, tennis, squash and other ball sports. For hiking, golf and skiing.